George Bush is still a relatively young guy, and will likely be alive many, many years after his presidency is complete. Much of the speculation around Bush's next step focuses on him clearing a lot of brush in Crawford or, if he is lucky, being appointed commissioner of baseball. But lately Bush has been displaying a surprisingly theatrical side which may provide clues into where Bush goes from here. 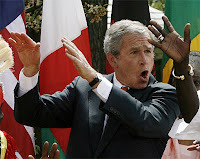 It started a few weeks ago in Africa when Bush showed the locals how exactly his tribe from Texas dances. This cultural exchange was dismissed as Bush having fun in the one region of the world besides home state where he is still well-liked. Only such logic can not explain why Bush performed a tap dance for the not-so friendly White House press last week, before bestowing upon poor John McCain his dreaded endorsement. Or why, after holding back for seven years, Bush unveiled a tuneful singing voice and enthusiastic stage presence during his skit at the press core's annual Gridiron Dinner. Ex-Presidents have become writers, gentleman farmers, university chancellors, members of congress and the Chief Justice of the Supreme Court. We might even soon have an ex-President first man. But an ex-President song and dance man? Who would have thought?